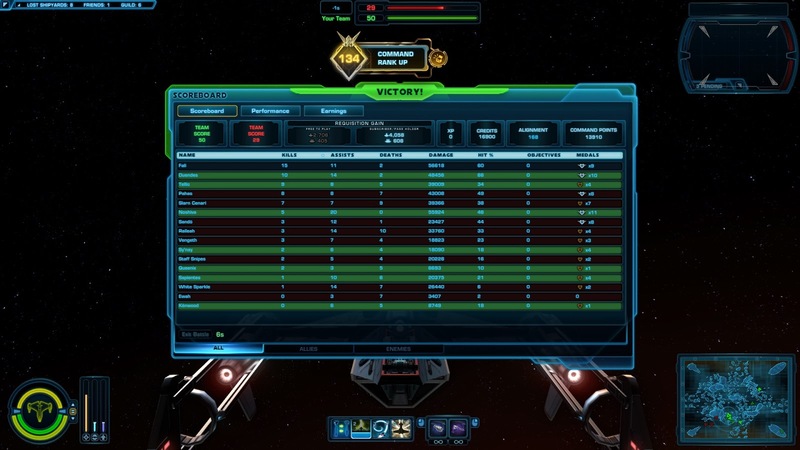 Going Commando | A SWTOR Fan Blog: Happy Grinding! I've thought for a while that Neverwinter is a perfect secondary MMO to play alongside SWTOR because its strengths lie in exactly the opposite places compared to SWTOR's. Not only does it provide me with a fantasy fix whenever I want one, it's also a great game to grind in. While grinding in MMOs has received a bad reputation over the past few years, I think that it absolutely has its place as a type of content - it just shouldn't be the only thing to do. Sometimes however, my mood is just right for a bit of mindless mob killing or performing other simple in-game tasks without much context that still give me the feeling that I'm progressing my character. SWTOR has generally been bad at providing this because most content requires attention, whether because there is some sort of story going on or because it's of a difficulty level that requires your full focus (e.g. raiding or PvP). Command XP didn't feel like a good addition at first because it made the mistake of wanting to be the only road to gear in town and on top of that it was painfully slow to get anywhere with it initially. With all the changes and buffs it's received since then, it's in a much better place though, and when Bioware announced that we were going to get a week of double Command XP this week (when I had already taken time off work no less), my ears certainly perked up. Why would I even grind CXP though? My main's already at rank 300 and in full 248 gear. Well, as I said above, sometimes I actually enjoy a bit of grinding - and with Command ranks advancing at twice the usual rate, I figured that it might actually feel rewarding to work on some alts. Not just for the gear - I read somewhere that dataminers have discovered that achievements for getting all eight classes to Command rank 300 might be coming up at some point. As silly as that sounds, for some reason this is the kind of achievement that really tickles my fancy, and I figured I might as well get a head-start this week. On Tuesday I was doing a round of Iokath dailies on my Guardian (before the event had even started) and quickly found myself feeling somewhat confused when after completing only two missions or so, I had already gained two Command levels. It was at this point that I noticed some guildies talking about how most dailies were bugged and giving way more XP than usual - fifteen times more than usual in fact! One of them joked about me being an exploiter now, which didn't really worry me as big part of actual exploiting is doing something that isn't part of normal gameplay... but it certainly felt odd, especially when the double rewards event started soon afterwards and those crazy numbers became even higher. Fortunately CS soon confirmed that nobody had to worry about "exploiting" this bug, and Musco's and Keith's official responses on the forums were examples of unusually good PR management for SWTOR: Basically they confirmed that it was a bug, but they could see why people enjoyed it and didn't consider it game-breaking, so they told people that they should enjoy it while it lasts. Keith even took feedback and noted that dailies were probably due for a CXP boost, even if it shouldn't be quite this much. So I actually did three daily areas on Tuesday, which is a lot for me as someone who's not a lover of dailies. I had no particular urge to just grind on one character like crazy, but instead saw it as an opportunity to give some love to alts that I usually don't play that much anymore. I was reminded that the alignment-resetting bug in Section X still exists when my Guardian was suddenly demoted from Light V to neutral - good thing she wasn't wearing anything with an alignment requirement. In-between I also queued for a couple of GSF matches, since that was the bonus activity for the day, and got what I think is my highest ever kill count in a match! On Wednesday the featured activity of the day were flashpoints, so I figured I would do some more dailies while waiting for pops, but my Imperial healer alts always got hardmode groups so quickly that they never had time to go anywhere. I actually ran six master mode flashpoints in a row that afternoon - I wouldn't have rated flashpoints as a grindy activity previously since they do require a certain minimum amount of attention, but in actuality it was less than I thought, especially in places like the Black Talon. None of my pugs were awful either, though I was a little sad inside when people insisted on running past the bonus boss in BT even though we were on the right step of the chain and he was right there. Some people just seem to be allergic to doing bonuses in the same way that I'm allergic to skipping them. I was somewhat compensated by tanks who later pushed for the bonus in both Boarding Party and Cademimu, which is somewhat rare from my experience. In the evening I also queued up on my Marauder, who did get to do some more dailies while waiting in the dps queue. The Czerka Core Meltdown I got into had one of the most heart-breaking pug moments I've ever seen, as after two wipes on the Vrblther (WTB some vowels please; I can't believe I spelled that right) the tank told our Sorc healer that he should probably leave and work on his gear some more and/or get more healing practice before trying hardmodes again. "If that's what you want," the healer said and exited the area - he looked so dejected! It was true though that his gear was pretty poor (not sure if bolster still helps if you're level 70) and he did silly things like spam Force Storm on the adds while people were dying all around him, but I still felt bad for him... I was also surprised because he had managed to successfully heal us through the Duneclaw, and I always considered that one much harder to heal. After he had quit, the tank whipped out his Vette to heal and on the next attempt nobody's health even did as much as dip. Companions, man. It'll be interesting to see what happens when they buff the CXP, especially if it applies to Heroics as well. CXP-Wise, a single run of a Planet with Dailies has been better than the vast majority of Heroic Planets ever since the Weeklies (discounting GSI and Makeb) were boosted to 750 CXP just after 5.1. There are some Heroic Planets which are lucrative in their own right (Republic Hoth, for example), but it takes near on an-hour earn as much CXP from them as you currently earn from CZ-198, Black Hole, or Ziost in 15 minutes. zones lose more CXP the second or third time around compared to Heroics since all you lose for Heroics are Bonus Missions which aren't always attached to missions anyway. Losing that Weekly's additional 750 CXP is much more painful. I do like the fact that people are finally realising how good Daily Zones are for CXP, but it shouldn't be because of a bug. But hey, if this exposure finally gets Section X fixed and nothing else then that's a decent result. I'm contemplating to take part in the grind. I ran two daily areas because of the "normal"-rotation via the galactic command panel early this week, but failed to recognise the bug. As a fact, i do like the planetary heroics missions more, because of the alliance crates. You can't have enough of these: money, armor, legacy-gear, gifts. But it is a hell of a lot CXP, isn't it?! God no...i just finished a round of three daily areas with my scoundrel healer. I logged out of the game. I have the whole day to play...but no...grinding is not my thing. Three areas would be about as much as I could stand in a day too! When you're used to doing none at all, it feels like quite a lot. :P Plus I also don't like doing dailies on a healer really... but that's why this is a good opportunity to level my dps alts a bit; otherwise I rarely play them. I normally run CZ-198 and Black Hole as a normal part of my credit/CXP grind and didn't pay attention to the huge amount of CXP I was getting. 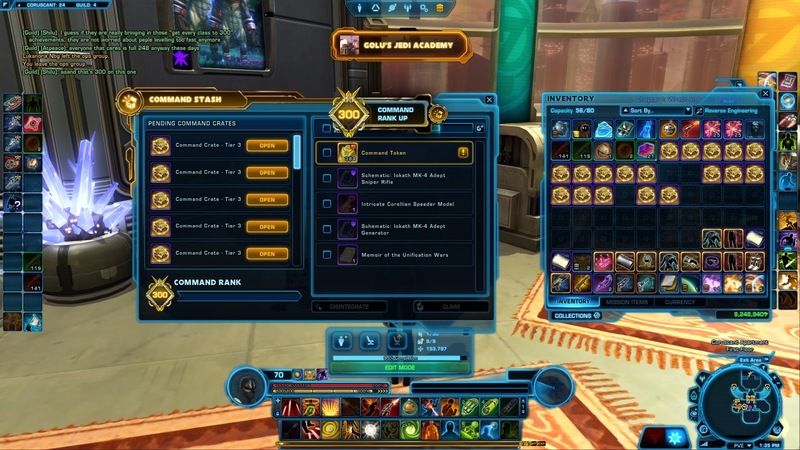 It makes it worth doing the weekly and even doing End of Torvex for the extra CXP. Normally I would only do the minimum missions on Oricon and Yavin 4 but with the boost to all the mission it was worth it to complete all the solo missions on those planets minus the solo Revan fight which is tedious and doesn't reward as much CXP. I hope when the CXP for the dailies return to normal Bioware will at least boost the weekly to make these places worth visiting once a week. 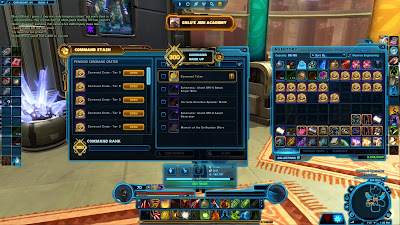 I do not like the new Iokath dailies though. You have to spend credits to take control over a something and if you mess up you lost you credits and shards for no reward. It would be better if you only had to spend shards but still on little mistake and you lose a weeks worth of grinding with no reward. Also I can't find the places I and supposed to look with my macrobinoculars. I shouldn't have to look up a guide to complete a regular mission. If it was a bonus mission like on Oricon I would understand but why couldn't they place markers like Ziost and Yavin for that mission. I don't mind grinding for rep but Iokath is the first daily area I detest. Regarding "Iokath-Dailies": i can't stand this planet. Did three daily-missions and left. Never returned. Weekly unfinished, reputation barely existent. I recently resubbed to the game after a lengthy break and my highest CXP rank was 15. Now I have one toon on 205 another at 195 and a third at 170. I should get at least one to 300 before the bug is fixed. I've never been a fan of grinding, but this week I've enjoyed it. I pop a 100% boost and try to see how many dailies I can do before it expires. It is a rather relaxing pastime with either music or a chill twitch stream on in the background. To be fair though is getting 30+ CXP levels in a two hour session really grinding? Well, it's still grindy in the sense that the content is somewhat mindless and repetitive. But it definitely feels more rewarding when you have 20 loots boxes to open afterwards instead of 2.